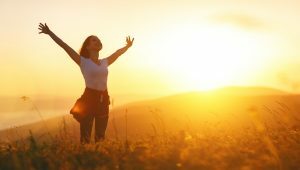 Why the Sunshine is good for you! In bright, sunshine-abundant weather, employees stay on-task with greater efficiency. The bright light helps keep employee brains awake, alert, and attentive. The boost in productivity from sunshine is due to employees wanting the end of the day upon them to enjoy the sunshine. Taking care of personal tasks after-hours often requires a bit of sunlight. Sun has an effect of either positivity or negativity when it comes to productivity. Some employees experience a greater amount of distractions from peering out at blue skies and bright sunshine. Adding window treatments in an effort of removing distractions work well. Ensure that supervisory staff signs off on the window treatments before installing them as safety concerns may arise from the use of outside materials. It elevates mood. “The sun works through a number of receptors in the brain to affect our mental status and alertness,” says Dr. Michael Roizen, Chief Wellness Officer at Cleveland Clinic, Ohio. Moderate sunlight exposure helps improve your mood and focus by boosting the serotonin levels in your body. Also known as the ‘happiness hormone’, it makes you calm and alert. Also, “sunlight decreases the risk of depression in those at risk of seasonal affective disorder (SAD),” adds Dr. Roizen. It improves sleep. “The brighter your daylight exposure, the more melatonin you produce at night,” says Dr. Mithu Storoni, physician, researcher and author of Stress-Proof. Melatonin is a type of hormone that’s “produced by the pineal gland in the brain during darkness at night”, she explains. Also known as the sleep hormone, melatonin has “a range of effects on the brain, from improving sleep to synchronizing your biological clocks, and lowering stress reactivity,” adds Dr. Storoni. Additionally, the amount of daylight exposure you get is crucial in maintaining a normal circadian rhythm. “Distorted circadian rhythms can induce symptoms of both depression and bipolar disorder, depending on the pattern of disruption,” says Dr. Storoni. It promotes bone growth. Vitamin D is “a hormone that promotes calcium absorption and is essential for bone growth and formation,” tells Dr. Roizen. Since sunlight is a primary source of Vitamin D, the hormone is also dubbed as ‘the sunshine vitamin’. “The Vitamin D found in our body needs activation. The sun helps to convert inactive Vitamin D levels to active,” explains Dr. Roizen. According to the World Health Organization (WHO), getting anywhere from 5 to 15 minutes of sunlight on your arms, hands, and face twice or thrice a week is enough to reap the vitamin D-boosting benefits of the sun. It helps strengthen the immune system. “Strong association studies have found that Vitamin D is also very important in signaling the immune system. It appears to be necessary in adequate amounts to turn on your ability to survey the rest of your cells,” says Dr.Roizen. Since regular sun exposure is one of the most robust ways to up active Vitamin-D levels in your body, it can help beef up your immune system as well. “Inadequate levels of this vitamin have been associated with an increased rate of infection, cancer, and mortality rate after surgery,” he adds. Another way apart from the Sunshine to keep employees happy is by offering extras on top of your employee’s salary and wages, will keep your employees engaged, motivated and will keep them with your business for much longer. Offering your employees a reward scheme such as Perks of my job will set you apart from your competitors and will show you truly care about your business. To ensure your business runs it’s best, you have to take care of the people within your business. That’s why Perks of my job is the reward scheme that keeps on giving. Let us know what small things make a big difference in your workplace. And could the easy, simple and small thing of signing up to perksofmyjob.com benefit your business?